Ladakh is the largest region in the Jammu and Kashmir state, covering about 60,000 square miles (100,000 sq. km). It is surrounded by some of the highest mountain ranges in the world. The great Himalayan range divides Kashmir from Ladakh. The valley stretch at an altitude of about 11,350 feet (3,500 m) and some of the surrounding peaks reach heights of 22,500 feet (7,000 m). Zanskar Mountains enclose the Zanskar River Valley. In the east is the Ladakh Range, forming the Indus River Valley, whereas to the northeast the Karakorum Mountains for the eastern boundary of Nubra Valley. Temperature in summer rarely exceeds 27 degree, while in winter they may at times plummet to minus 20 degree even in Leh. The thin air makes the heat of the sun even more intense than at lower altitudes.The height of these ranges prevents rain clouds from crossing into Ladakh and as a result, Ladakh receives only about 2 inches (5 cm) of rain every year. 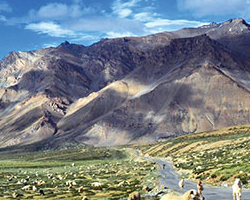 The aridity of the area is immediately apparent to the visitor, with Ladakh’s long vistas of mountains without vegetation and valleys with only a few oasis of green. The Indus River runs through Ladakh and the 30-mile (50 km) stretch of the Indus River Valley between Spitok gompa (near Leh airport) and Hemis gompa is the heartland of Ladakh.